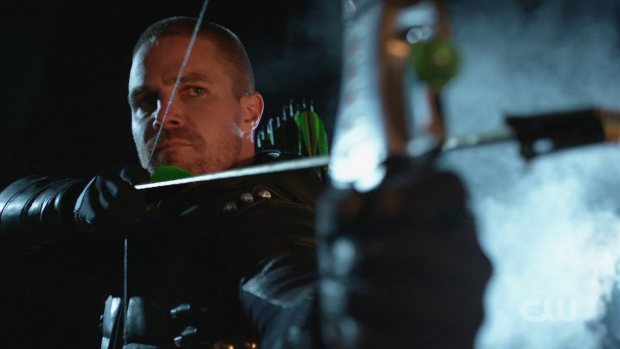 Arrow deals with the aftermath of Oliver’s release from prison by exploring what his life and the structure of the show looks like with the shift in status quo. 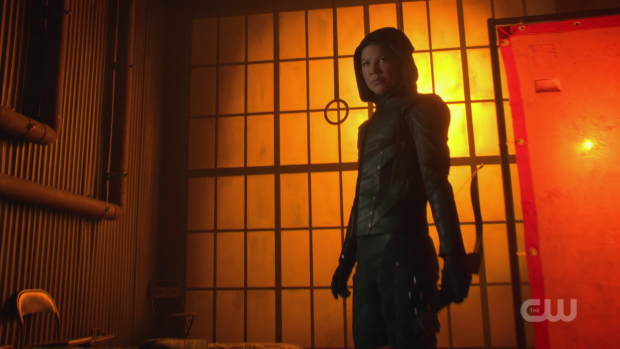 In a way, Oliver’s imprisonment was a really simple solution to the problem of Oliver Queen’s vigilante double life being known to the public. It meant that the writers didn’t really have to worry about Oliver living in a world where he had no real reason to suit up since hiding his identity was no longer necessary. Now that he’s out of prison there are a lot of questions to be answered and this episode makes an attempt to cover at least some of them. This makes for a really slow burn that feels necessary for this part of the season. The first half of the episode deals with the change in the status quo and has Oliver himself question what his place in the world is now that he’s out of prison with no real purpose other than living his life. In theory after everything he has endured that should be enough for him but this show is in its 7th season and audiences know that Oliver’s sense of responsibility won’t ever simply let him rest. That’s why an episode like this is so necessary; it encourages Oliver to do some soul searching and look to find his place in the world following all of the changes in his life. The first thing he tries is acting as the human face of prisoner rights following the treatment he received at the hands of a corrupt system at Slabside though it’s immediately clear that he’s less than enthusiastic about that. Up until the point there’s an attack at the benefit in his honour he seems to be running on autopilot. The attack gives him something to be passionate about and lets him shift gears into something resembling old times. I’ve talked a lot about the writers sticking with the Arrow formula while making changes to it in order to deliver an experience that is familiar to fans of the show yet different enough to show that there have been significant changes to the characters as well as the world that they live in. This episode is a great example of that as the former Team Arrow are looking into the attack but they are deployed in different roles which automatically makes the standard storytelling feel different. Dinah’s role as Captain of the SCPD provides some great opportunities to show how things could work in the world it now inhabits. She faces pressure from the Mayor who doubts her ability to stick to the letter of the law in order to solve the investigation and is struggling with the temptation to leap into action as a costumed vigilante. She’s starting to realise that going by the book is a lot slower and infinitely more frustrating. There are also advantages to her position. Oliver has considerable skills that would arguably go to waste if not used to help protect people. The compromise to being unable to act as a vigilante is to have him deputised by the SSPD which allows Oliver to be in costume fighting criminals with people knowing his identity. It’s a great idea as there is so much potential for storytelling now that Oliver has to deal with bureacratic oversight. He now effectively has to answer to Dinah when in the past he was used to coming up with plans and executing them himself. This is a great way to alter an existing formula without losing the essence of it. It could also take Oliver as the Green Arrow further down the path of being the man of the people similar to his comic book counterpart. All of this is good but it also feels a bit abrupt. Having Oliver transition from adjusting to life outside of prison to being back in costume in the space of a single episode feels rushed. I suspect that this was necessary given that the crossover happens next week but it doesn’t alter the fact that there should have been more of a grace period before putting Oliver back in the costume. The Mark of Four…is that it? Another thing that feels rushed is the reveal of the identity of the new Green Arrow. It’s definitely a surprise that behind the mask is another child of Robert Queen and that Oliver Queen has a sister but there’s so much going on that the impact is lessened. Oliver doesn’t currently know this information so the emotional impact is yet to come though there is a danger that it will feel repetitive considering Oliver already learned that he has a son he didn’t previously know existed. It depends how this plays out but kudos to the writers for revealing the identity as someone that would never be expected. Despite the rushed quality to the storytelling there is a lot of good stuff in here. Rene’s perspective on the current situation is fascinating and sets up what could be an excellent story for him. He passionately comments on how people end up in the prison system because they live in a society that has all but abandoned them. In his view people have nothing so end up making bad choices and find themselves mistreated by a corrupt prison system. Dinah puts the idea of running for office in his head which seems like it’s going to play out across the rest of the season. Considering Rene has often been a supporting character with a lot of potential I find myself really interested in seeing him take on a more central role that opens him up to different storytelling possibilities. The future scenes strongly hint that Rene will become a figure of influence in the Glades as the next move for the characters in this plot is to head to the glades to see Rene. Once again little morsels of information are being released that flesh out this dark timeline. We already know that Felicity planned to destroy the city and now it seems that the uprising that started in the Glades has Rene as its leader. What happens in order to make Rene turn so completely against the legitimate authorities is as yet unclear but the implication is that a consistent failure to recognise the voices of those in the Glades is to blame. Dinah is specifically called out as being responsible for the state of the city though I imagine that’s an emotional reaction to the situation with the truth of the matter being more complicated than that. Hopefully the release of information will continue to happen in this way as the writers are doing a great job avoiding exposition. Some of the reveals are a little underwhelming considering the implied importance that came with the tease. The Mark of Four was teased as something enigmatic and secretive but it turns out to be little more than a team tattoo conceived by Oliver to represent the four pillars of heroism; courage, compassion, selflessness and loyalty. It makes sense because it serves as a reminder of the values that Team Arrow have chosen to stand for but in context of this plot it makes for an underwhelming reveal. Similarly the reveal of Blackstar or Maya (Katherine McNamara) doesn’t match up to the suggested importance as she turns out to be a cage fighter who likes money and knows Felicity. I’m not saying she isn’t a good addition to the show but the writers attach too much mystique to these mundane reveals. I mentioned in earlier reviews that the future scenes struggled to connect to the present day storyline but the narrative is slowly falling into place. Seeing the end result of character arcs that are currently in play is a brave move as it confines the writers to heading down that road whether people respond to it or not. It also makes the present day narrative somewhat bittersweet as we know that the best efforts of everyone involved won’t have a positive outcome unless time travel comes into play somehow. 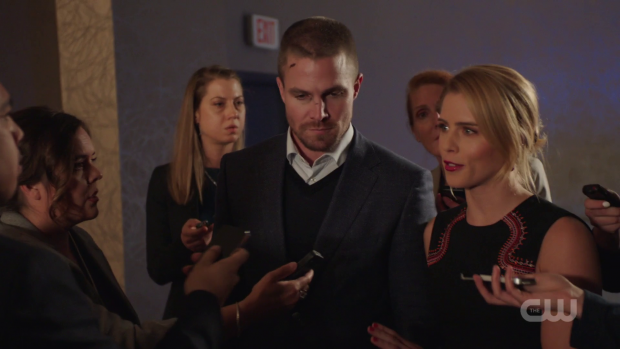 Felicity’s inevitable descent into villainy isn’t slowed by Oliver’s return. It’s already well established that she is constantly looking over her shoulder and motivated by a great deal of fear. Oliver’s freedom from prison does nothing to mitigate this and he’s shocked to discover how much she has changed. Her justification for this is reasonable enough; Oliver made a decision that affected both her and William without consulting them about it before making it. The end result of this was Felicity living in terror as Diaz tried to find her and kill her. It’s enough to push anyone over the edge and that’s just what has happened here. The additional complication is that she has no real interest in getting back to the person she used to be despite the return to relative normality. Oliver’s reaction to the change in Felicity is best shown through his reaction to her having a gun. That one object represents a significant change in Felicity because he doesn’t see her as the sort of person who would feel the need to keep one. The changes in her since his absence has turned her into that sort of person and then some. Evil Laurel mentions that Felicity is ruthless and she’s definitely right when considering the mounting evidence over the past few episodes. Bizarrely Felicity chooses to break up with Oliver or at least put their relationship on hold for the time being. I found this to be both surprising and frustrating. Long time readers of this site will know that melodramatic angst is one of my least favourite things to be found in a TV show and sending the Oliver/Felicity relationship back down that road is definitely something I could do without. The future scenes strongly hint that the relationship breaks down anyway so maybe this is a temporary bump on that road that will stabilise before escalating in the future or it could be permanent; time will tell. The episode ends with the same crossover tease featured in this week’s episode of Supergirl. 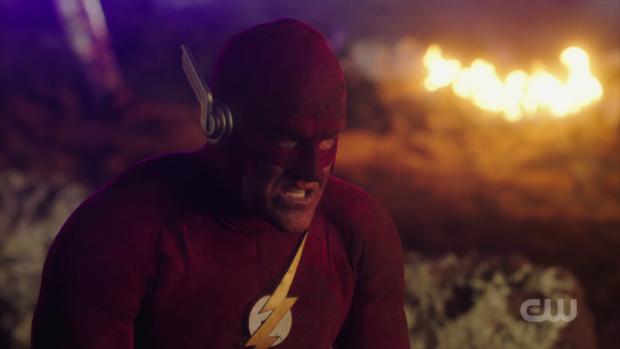 My guess is that it will appear in The Flash as well. I have little more to say than I’m very excited. A solid if slightly rushed episode that introduces some compelling ideas but speeds through plot that could have been told at a much more deliberate pace. Oliver adjusting to life outside of prison when he can’t act as the Green Arrow is a compelling issue for him and it does play out well. The uncertainty he feels over what to do next makes a lot of sense and I like that he finds a middle ground through using his skills in service of the SCPD. This gives him bureaucratic oversight while also promoting him as the man of the people type of hero similar to his comic book counterpart. Setting up Rene as a potential political candidate is an interesting development and works in line with his values while making use of his perspective on the situation. Picking up Rene’s candidacy in the future scenes by establishing him as a major player in the Glades gives an idea of where this is all heading while still retaining the mystique. The present day story has a bittersweet edge to it because of how badly it is known to turn out. There are a couple of reveals in the future scenes that don’t live up to the secrecy surrounding their earlier mentions but otherwise this narrative continues to be worthwhile. The reveal of the new Green Arrow as Oliver’s sister he never knew that he had runs the risk of being repetitive considering Oliver already found a son he didn’t know about but it all depends how it is played once he learns about her. Felicity’s continued descent into darkness is handled well in the sense that Oliver is shocked by how much she has changed and she has a valid point around what caused her to feel that way but her apparently breaking up with him injects more unnecessary angst into their relationship after that appeared to have been put to an end.